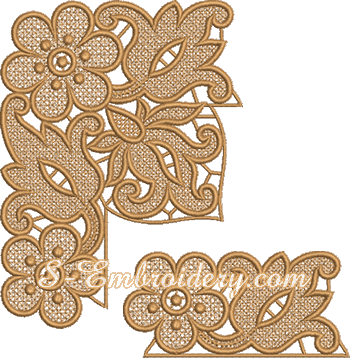 The floral free standing lace edging set includes 2 machine embroidery designs – a corner and a border. 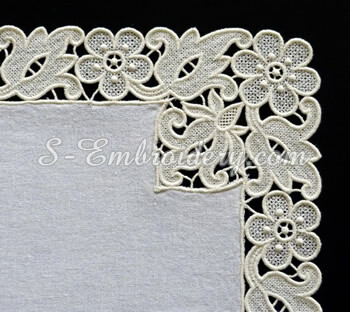 You can use this elegant lace embroidery set for a variety of embroidery projects with a different size. In combination with a suitable fabric (e.g. 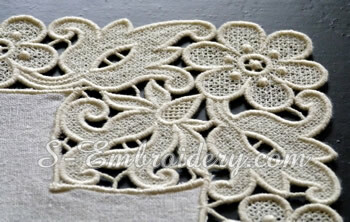 linen) you can create a doily, table runner, table top of a large table cloth with a nice lace edging. 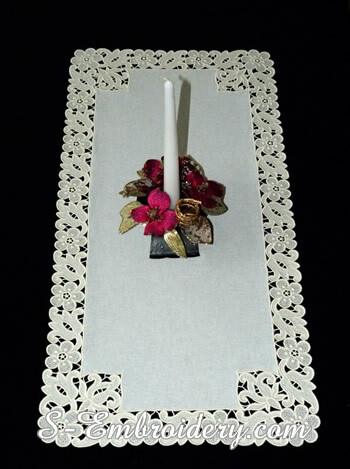 The table runner we have featured on our web site as an illustration measures approximately 34 x 70 cm (13.4 x 27.5 inches). Creating a similar project would not be a problem even for the embroidery novice. Of course, as all similar products, the set comes with illustrated instructions in PDF format.